...... With features above, 4Easysoft RM Video Converter is the affordable and qualified RM to Video converter! Supports output video/audio formats - it can easily convert RM to AVI as RM to AVI converter, with the supporting of converting RM, RMVB to AVI, MPEG, MP4, 3GP, 3G2, MOV, MPG, VOB and WMV. Besides, it's also a good RM to MP3 converter which enables you to convert RM to MP3, and extract audios including AAC, MP3, WAV, and WMA from Real Media files. Compatible with all portable mobile players - supports the mobile players such as iPod series, iPhone, Apple TV, PSP, Walkman, Xbox 360, Zune, Archos, iRiver, Creative Zen, BlackBerry, LG, Pocket PC, Smart Phone, etc. Split segments - split movies by presetting the exact start and end time, or just dragging the slider bar. 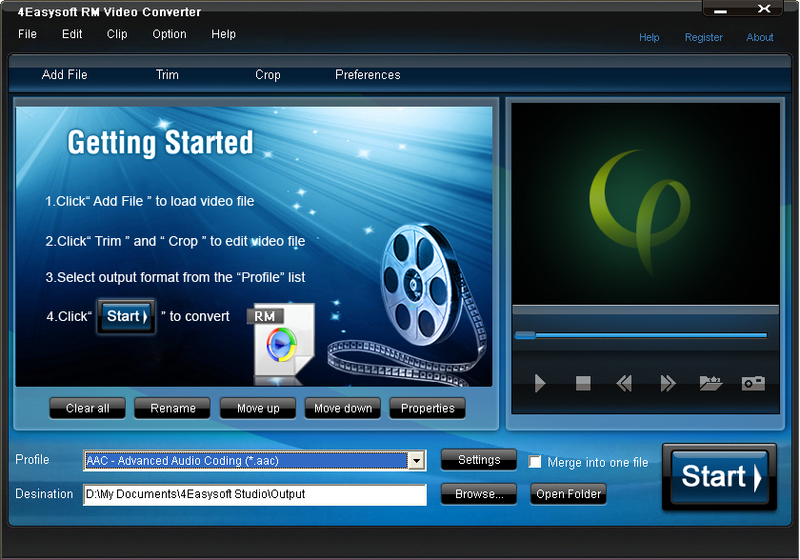 Convert video formats to RM/MP3 clips or play them in your PC or other RM player. Top RM Video Converter can convert video to rm or convert rm to video. Convert video files to RM format files. Qweas is providing links to 4Easysoft RM Video Converter 3.1.12 as a courtesy, and makes no representations regarding 4Easysoft RM Video Converter or any other applications or any information related thereto. Any questions, complaints or claims regarding this application 4Easysoft RM Video Converter 3.1.12 must be directed to the appropriate software vendor. You may click the publisher link of 4Easysoft RM Video Converter on the top of this page to get more details about the vendor.